I began my internship this week. I had about a week beforehand to prepare, so I crammed as much as I could on materials covering software testing and the C# programming language. I attended my new hire orientation and met the team I’ll be working with. Everyone has been very welcoming so far. The offices are fantastic; being a company that makes games, there is art and sculpture everywhere. The cubicles are all decked out with decorations and overall it feels very comfortable as far as office buildings go. 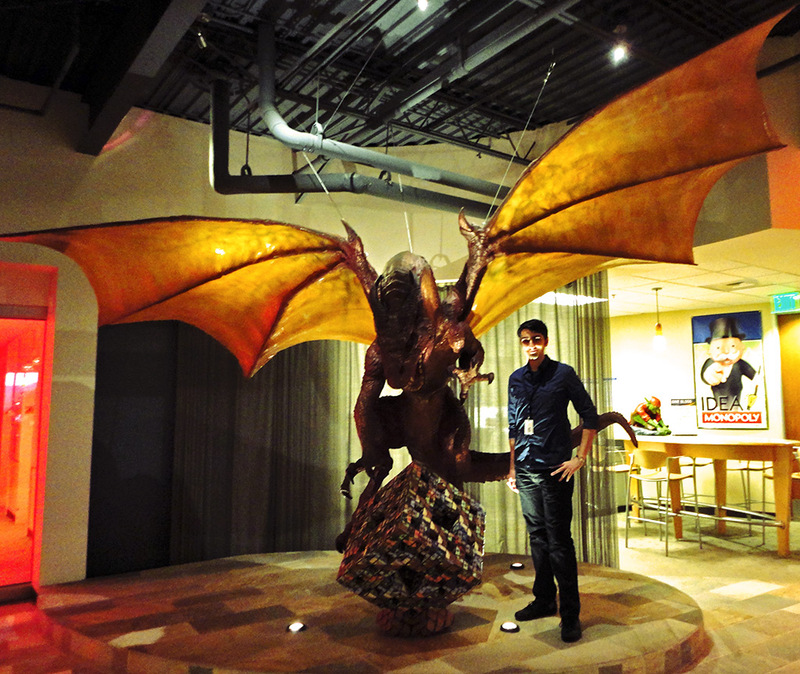 And there is a giant dragon in the lobby! Me and Mitzy, the resident lobbydragon. As far as actual work goes, my first week was mostly spent oriented myself with their software and culture. Ernie (my supervisor) supports several different teams around the office, so it seems like I’ll get exposed to a variety of projects and methodologies. On his advice, I am working my way through a book called “Professional Application Lifecycle Management with Visual Studio 2010”. Techniques I learned this week included initial exploration of Visual Studio’s suite of test tools. I also wrote some man pages about various testing tools for the internal wiki; this was a good exercise that helped acquaint me with the tools and their functionality. I attended daily standup meetings with the Software QA team and will continue to do so. Culturewise, I attended a couple of company gaming sessions including a confidential playtest for an unreleased product. It was a blast! Overall, it has been a very positive experience thus far. More to come!